Fascinated by Ghosts? This October, Hotel Galvez & Spa, A Wyndham Grand® Hotel and National Trust Historic Hotel of America, invites guests to learn more about the paranormal during its annual “Dinner with the Ghosts” ghost tour and dinner event. During the 104-year-old historic Texas hotel’s one-hour tour, the Hotel Galvez concierge will guide guests through the hotel’s ghostly past using popular ghost hunting tools to conduct a paranormal investigation. Guests will learn about the hotel’s “Ghost Bride” and other reported strange occurrences. The tour begins at 6 p.m. and will be followed by a three-course dinner at Galvez Bar & Grill at 7 p.m. Guests can book the tour and dinner package beginning Tuesday, Sept. 1, for Tuesday, Wednesday and Thursday evenings throughout October. The cost for the tour and dinner package is $45 per person. “Guests will learn a bit of history of the hotel, hear and share ghost stories and enjoy a delicious dinner in the Galvez Bar & Grill, making for an evening of ghostly fun in Galveston,” said the hotel’s general manager, Steve Cunningham. 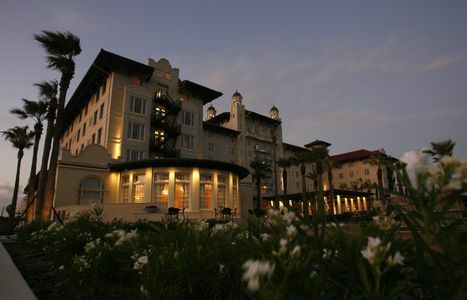 In addition to the tour and dinner event, the hotel will also offer a “Dinner with the Ghosts” overnight package, available Tuesday through Thursday starting at $259, which includes one night in a deluxe guest room following the event, plus a copy of “Haunted Galveston” by Amy Matsumoto. On Fridays, the hotel’s “Dinner with the Ghosts” event is exclusively available as an overnight package, starting at $289 and including a deluxe guest room, the ghost tour, dinner for two, valet parking and a copy of “Haunted Galveston” by Amy Matsumoto. Overnight packages are available to book online now. Hotel staff has often reported odd occurrences throughout the hotel, such as candles blowing out on their own, dishes breaking with no one around and unexplained breathing or children’s laughter in some public areas. Similarly, guests have occasionally reported seeing or sensing spirits in their rooms or unexplained orbs in their photos, including the hotel’s “Ghost Bride” which has reportedly been seen in Room 501 and throughout the fifth floor. Hotel Galvez and its ghosts have been featured on the Travel Channel’s Ghost Stories and on Discovery Channel’s Ghost Lab. To make a reservation for the ghost tour and dinner package, please contact the Galvez Bar & Grill at (409) 515-2154. 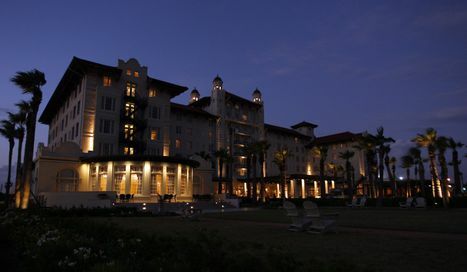 To book the Dinner with the Ghosts overnight package, please visit www.HotelGalvez.com and see special offers. Part of Wyndham Hotel Group, Wyndham Hotels and Resorts, LLC, offers upscale hotel and resort accommodations at more than 200 properties throughout the United States, Canada, Mexico, Central and South America, the Caribbean, Europe, the Middle East and China. Most Wyndham® hotels are franchised by Wyndham Hotels and Resorts, LLC with the exception of certain Wyndham hotels which are or owned or managed by one if its affiliates. Additional information and reservations for all Wyndham hotels are available by visiting www.wyndham.com. Travelers have the opportunity to earn and redeem points through Wyndham Rewards®, the brand’s guest loyalty program, which can be joined for free at www.wyndhamrewards.com. Wyndham Hotel Group is the world’s largest hotel company based on number of hotels, encompassing over 7,670 hotels and over 667,000 rooms in 70 countries. Additional information is available at www.wyndhamworldwide.com. For more information about hotel franchising opportunities visit www.whgdevelopment.com.